Soft-hitting Filipino journeyman Donny "Mr. Shallow" Mabao (21-20-1, 4 KO's) of Bukidnon is set to clash in a complicated 12-rounder against the undefeated world-ranked Japanese National Champion Ryuji Hara (16-0, 10 KO's) of Yokohama for the vacant WBC OPBF Minimumweight Championship on Sunday (March 30) at the Fujisan Messe in Fuji-shi, Shizuoka Prefecture in eastern Japan. The promising 23-year-old Ryuuji Hara is one of the few boxers in planet ranked by all major boxing organizations. Hara is currently IBF # 3, WBA #4, WBO # 5 and WBC #11, and the tough unbeaten Japanese wants to keep on climbing. Fate hasn't been that bright for the hard working Donny as this fight in Japan will mark the 9th time that "Mr. Shallow" battles in a foreign country. His eight prior outings have been all defeats. But he is 25-year-old "Mr. Shallow" hopes that the number "9" will be his lucky number, even thought the mission against Ryuji Hara will be by no means easy. One worrisome issue is the fact that Donny lacks power punch: only 4 KO wins in a 42 fights (9.52% ratio) denotes low potency in its blows. In contrast, Ryuji Hara - with 10 KO's in 16 wins (for a 62.5% ratio - tells us that he is a much harder puncher. 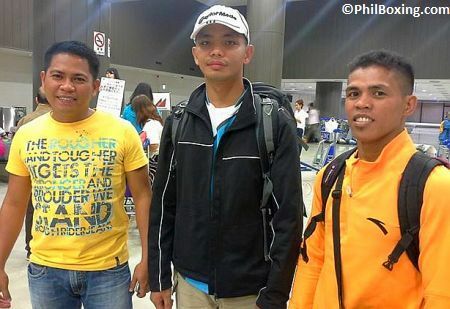 Donny Mabao of Bukidnon arrives in Japan for his WBC OPBF Battle against Japanese Champion Hara on March 30. From L to R Filipino Judge Nowel Haduca, Cornerman Sonny Dichoso and far right boxer Donny Mr Shallow Mabao. 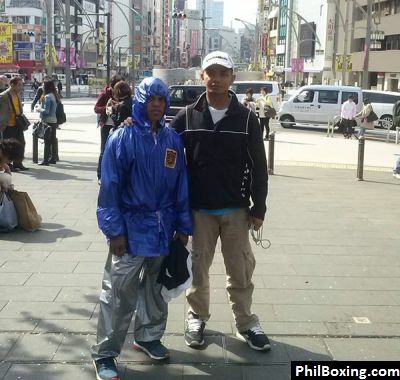 Boxer Donny Mr Shallow Mabao L with his Cornerman Sonny Dichoso today in Japan. Boxing is an amazing sport in which things on paper could be very different with the reality. But in this case our logic tells us that "Blow-by-Blow" close quarters exchanges with this Japanese slugger is not the wise approach. Instead, "Mr. Shallow" should make good use of his wider experience against this tough Nippon who will be fighting in Shizuoka, the eastern sea side prefecture where he was born. Hara is the local kid. 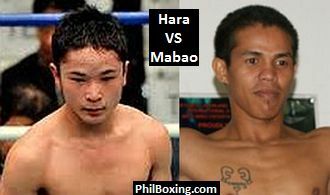 That's why the brave Filipino should throw lot of left jabs, straight rights and combinations, together with smart moves to the left of Hara. To the left of Hara because he is an orthodox who opens attacks with left Jabs). Distance and good boxing skills are of the essence for Donny on Sunday night. In fact, Donny "Mr. Shallow" has been doing well recently, coming from 4 straight wins. So with good focus, speed and heart, this could be his most rewarding 5th win in-a-row and the OPBF Title on his waist. Let's hope so. However, 12 rounds is a long way. That's why Donny's concentration must be superb. In addition, hopefully, his physical conditions are top-notch as its clear that Ryuji Hara will press forward like a bull, looking for a knock out win. Mabao normally trains at the high-elevation facility of the Highland Boxing Gym in La Trinidad, Benguet Province. Let's hope that the good pure oxygen of the Strawberry productive area of Benguet would bring the Filipino the extra supply of air needed in such a long battle. During his fight in Japan, Donny will be assisted by manager Brico Santig, head of Benguet's Highland Boxing, cornerman Sonny Dichoso. Top Filipino judge 31-year-old Nowel G. Haduca of Ilocos Sur (now living in Caloocan, Metro Manila) is also in Fiji-shi, Shizuoka Prefecture, Japan. The other two judges and the referee are from Japan.